Due to its potential to make computers faster and smartphones more efficient, spintronics is considered a promising concept for the future of electronics. 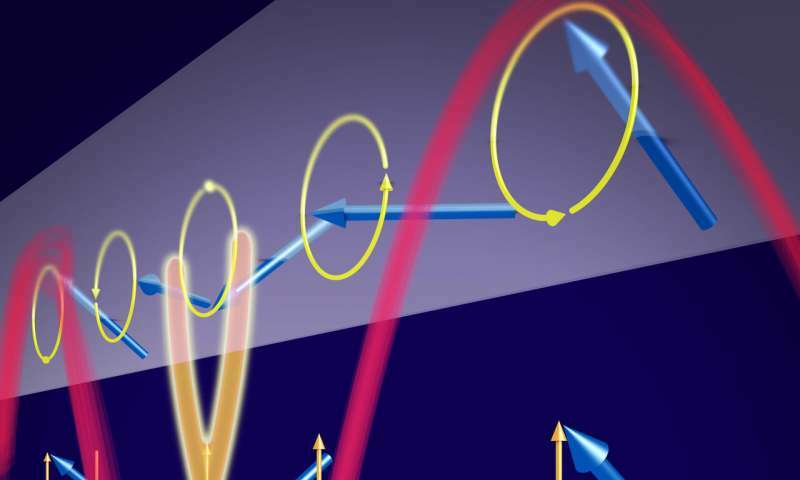 In a collaboration including the Max Planck Institute for Intelligent Systems (MPI-IS) and the Helmholtz-Zentrum Dresden-Rossendorf (HZDR), a team of researchers has now successfully generated so-called spin waves much more easily and efficiently than was previously deemed possible. The researchers are presenting their results in the journal Physical Review Letters. Modern computer chips are based on transporting electric charges. Each processing event causes an electron current to flow in an electronic component. These electrons encounter resistance, which generates undesired heat. The smaller the structures on a chip, the more difficult it is to dissipate the heat. This charge-based architecture is also partially the reason why the processors' clock rates have not seen any significant increases in years. The steady development curve of chip performance and speed is now flattening. "Existing concepts are reaching their limits," explains Dr. Sebastian Wintz from the Institute of Ion Beam Physics and Materials Research at HZDR. "This is why we are working on a new strategy, the spin waves." This approach no longer involves transporting charges, but only transfers the electrons' intrinsic angular momentum (spin) in a magnetic material. The electrons themselves remain stationary, while only their spins change. Since the spins of neighboring electrons sense each other, a change in one spin can travel to its neighbors. The result is a magnetic signal running through the material like a wave—a spin wave. The advantage of spin-powered components is that they would generate very little heat, which means they might use significantly less energy—and this is of great interest for mobile devices such as smartphones. It may also be possible to further miniaturize components for certain applications because spin waves have far shorter wavelengths than comparable electromagnetic signals, for instance in mobile communication. This means we could fit more circuits onto a chip than we can today. Before we can do all this, we first need a lot more fundamental research. For instance, we need to know how to efficiently generate spin waves. Experts have been trying to work this out for a while now, attaching micrometer-sized metal strips onto thin magnetic layers. An alternating current running through this strip creates a magnetic field that is limited to a very small space. This field will then excite a spin wave in the magnetic layer. But this method has one disadvantage: It is difficult to make the wavelength of the generated spin waves smaller than the width of the metal strip—which is unfavorable for the development of highly integrated components with nanometer-sized structures. Yet there is an alternative: A magnetic material shaped into circular disks evokes the formation of magnetic vortices whose cores measure no more than about ten nanometers. A magnetic field can then make this vortex core oscillate, which triggers a spin wave in the layer. "Some time ago, we needed relatively complex multi-layered materials to make this happen," Wintz reports. "Now we have managed to send out spin waves from vortex cores in a very simple material." They use an easy-to-manufacture nickel iron alloy layer of about 100 nanometers in thickness. What's remarkable is the wavelength of the generated spin waves—a mere 80 nanometers. "The expert community was surprised we did this in such a simple material," says Dr. Georg Dieterle, who explored the phenomenon in his Ph.D. thesis at MPI-IS. "We also didn't expect to be able to generate such short waves at frequencies in the lower gigahertz range." Experts think that the reason for the short wavelengths resides in the way they travel. Close to the cross-sectional center of the nickel iron layer, the spin wave forms a sort of "knot", inside of which the magnetic direction oscillates only up and down rather than along its usually circular trajectory. To make these phenomena visible, the team used a special X-ray microscope at the electron storage ring BESSY II at the Helmholtz Zentrum Berlin. "This is the only place on earth that offers the necessary space and time resolutions in this combination," emphasizes Prof. Gisela Schütz, director at MPI-IS. "Without this microscope, we would not have been able to observe these effects." Now the experts are hoping that their results will help further the development of spintronics. "Our vortex cores could, for instance, serve as a local, well controllable source to explore the underlying phenomena and develop new concepts with spin-wave-based components," Dieterle says. "The spin waves we observed could be of future relevance to highly integrated circuits." Faraday spintronics flash file animation.